A 22-year-old skateboarder was knifed at least three times -- in the stomach, back and thigh -- following a road-rage fight with a bicyclist in midtown earlier this week, authorities say. The victim and the bicyclist started arguing around 8:30 p.m. Monday near 42nd Street between Park and Lexington avenues and the dispute escalated, with the bicyclist repeatedly stabbing the skateboarder in front of an eyewear shop, police say. The skateboarder was taken to a hospital in stable condition. 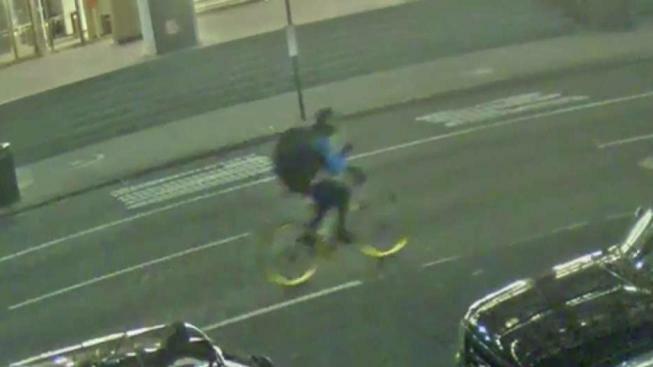 The bicyclist is still on the loose -- he rode off down East 48th Street and was last seen at East 51st Street and Third Avenue. Police released surveillance video of the suspect (above). Anyone with information about him or the attack is asked to call authorities.